Who’s looking out for the inner-city youth of Toronto? Overtime, I’ve attended my fair share of technology events for youth in Toronto. Though technology events for kids is still a new a relatively new concept in our city, there are a bunch of fabulous organizations in the city leading the charge of helping put more and more youth in-front of computers and technology-focused role models. They are in fact doing great things and I’m proud to work, volunteer and know the individuals behind a lot of them. It wasn’t until after having attended a lot of them that I started to realize that at the events I was attending, all the kids were starting to look……..the same. I really started to notice the low diversity (background, education, ethnic, location etc.) in the individuals. Most of the individuals attending the workshops were on average from reputable schools in the city, middle to upper class families, had access to computers/mobile phones or even owned their own and came from households where their parents understood the importance or even worked in technology. Though there isn’t anything wrong with this, I did increasingly start to wonder who was working with our more ethnically diverse inner-city youth who didn’t have access to resources or who’s parents didn’t know the importance of coding and it’s role in a future job for their child. This leads me to the next part, I want to tell you a story about Sarah and her mom Helen. I met Sarah last year at a coding event where she jumped off a bus with 6 young girls in tow and registered them for the event. I remember her approaching me and saying “don’t worry, they’re not all mine.” In fact, none of them were hers. She was dropping them to the day-long workshop and picking them up to take them back to their homes at the end of the day (later I learned that many of the youth in the area Sarah and her mom work in don’t actually get many opportunities to leave the neighborhood so this was a big deal to them). 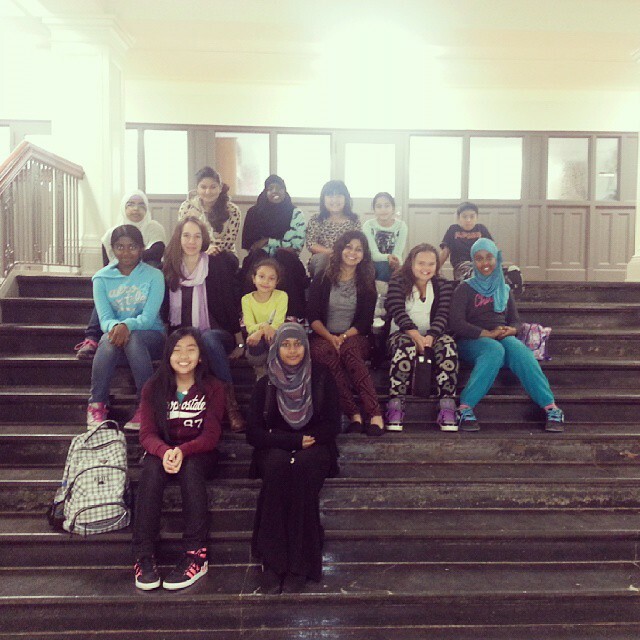 I quickly learned of Sarah and her organization Girls Crack the Code which encourages opportunities for young girls (and boys) in Regent Park to learn technical skills. For those that don’t know, Regent Park is Canada’s oldest and largest social housing project which is currently undergoing a lot of changes. To put it in perspectives, and one of the reasons for the recent revitalization of Regent Park, a majority of families living in Regent Park are classified as low-income, with 68% of the population living below Statistics Canada’s Low-Income Cut-Off Rate in one of its census tracts. Clearly an area in need of a lot of attention, guidance and mentoring. Helen is a teacher at a local school and she’s one of those special kinds of people. She’s a teacher who genuinely cares about the well-being, future and education of her students and the students who are not even in her class. You can often find Sarah helping out her mother in the classroom during the day, even though she still works a full-time job during the nights. Together the two dig into their own pockets and pay for some of the youth in the Regent Park community to attend tech events that they otherwise wouldn’t have access to and workshops where they can develop their technical skills. They even ask (and have received) scholarships from local organizations providing youth workshops. And they don’t just tell the parents that their child has received a scholarship to attend a day-long tech event so they should arrange to drop/pick them up because in all honestly, these parents might not have the means to drop off or pick up their children given financial, work and transportation constraints. No, Sarah gathers the youth and personally takes them to the workshop and helps with anything they need. She’s a real life big sister to all of these children and she’s always looking out for their well-being. Sarah and Helen are my hero’s of Toronto. They are the ones who deserve to be recognized for their dedication, support and desire to enrich the lives of the youth in Regent Park. There work touches my heart and even though I might not be doing what they do I want to know how I can help them. I’ve asked Sarah a few times to tell me what I can do, what does she need, and who does she need to be in touch with. Knowing full well that these are they type of people I want to work with. I have gone to the school in which Helen works at and done a lunch tutorial on how to remix videos and make a story through gif’s using Webmaker’s Popcorn Maker tool. The group of 15 students got into small groups and then made their own videos. They did pretty darn great too. When I was leaving, Sarah told me that they’ll probably talk about me for the next week. I thought that if a couple hours had a week long impact on these young kids imagine what more time could do. As I walked out the door, I couldn’t help but feel like I wanted to have a great role in the lives of these kids. Post-workshop taking a group photo with the students. One of my bigger observations has been it’s becoming increasingly apparent that it is not enough to reach the parents who understand the importance of technical skills in their child’s future. We need to also start focusing on the parents who might not be aware of what opportunities lie ahead with a career or understanding of the online or technical world. The individuals who are more disconnected from mass media and haven’t seen the latest celebrity that has released an article on why everyone should learn to code. These are the future generations where we can have the most impact in shaping their future and this is where I want to spend my time volunteering. I want these kids to know that people that look like them or came from backgrounds like them can do incredible things with the opportunities at hand and they can start accessing those opportunities at any age despite their income level, looks, background or another misconceived notion they might have. Also, we need more Sarah and Helen’s of the world. We need to take the people that care about the inner-city kids and help or support them to further mentor these students and help shape their lives. I for one want to meet more of them and support them in any way I can. Disclaimer: I in no way take claim that I know the full makeup of all the youth focused tech workshops in Toronto. There are many local organizations doing great things in their respective communities geared towards youth and there are many “Sarah and Helen’s” around the city. The current organizations in Toronto are doing phenomenal things and changing the lives of youth in our city everyday. My comments are not meant to be a negative reflection of them but merely an encouragement for organizations to look at new in-need audiences as well as their existing ones.